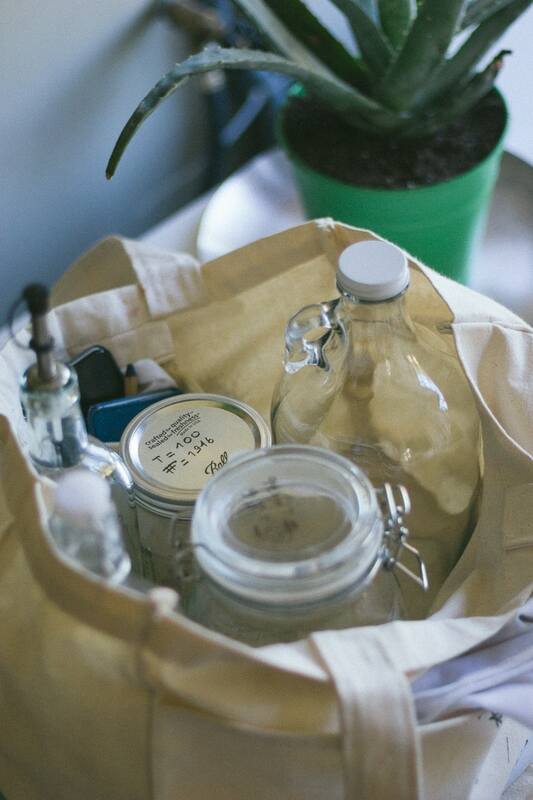 What is Zero Waste Shopping? Ever since I moved to my new hometown, I've taken up zero waste shopping. To me, this means: a/ buying package-free (in bulk) as much as possible and b/ choosing recyclable packaging (glass, metal, paper) for items I cannot find in bulk. Where can one shop in bulk? After doing a little research, I chose a local supermarket to shop at, but then found some very interesting alternatives: a new farmers market in my neighborhood, and a cooperative which I'm now a member of and where I do most of my grocery shopping. Bea Johnson created her own bulk store locator and my friend Inge is working on her own Zero Waste app. If you're in Portland, I've got you covered with my Portland Zero Waste City Guide. What does one need to shop waste-free? 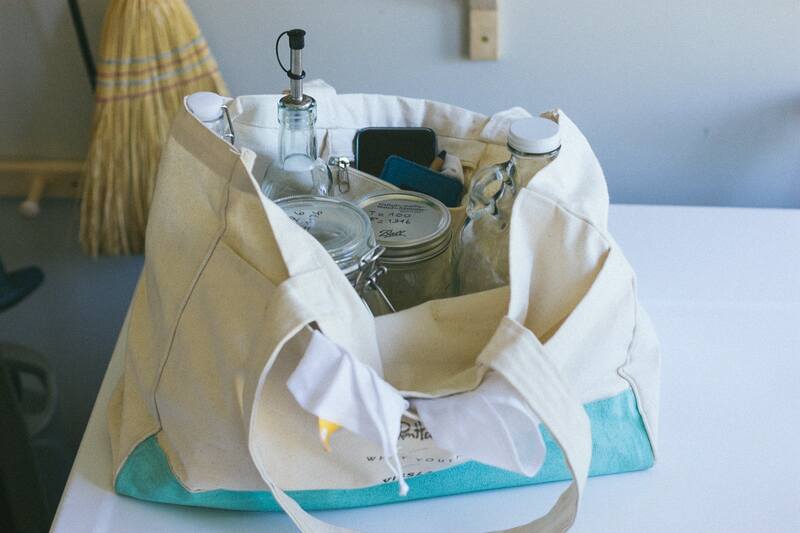 Tote bags hoarders, raise your hand if you're with me? I use one that was given to me at an event. 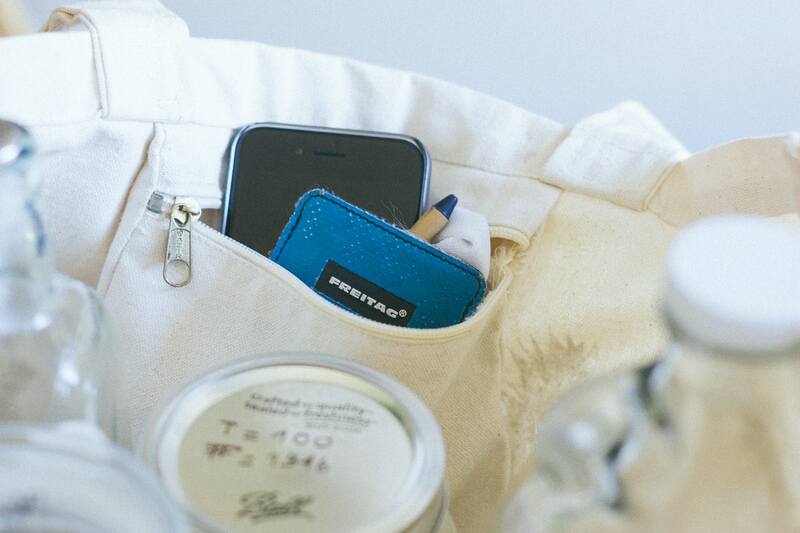 It is super convenient as it has a small pocket inside where I can put my crayon, phone, card holder and keys. But I'm keeping these market bags* on my list (their wide bottom seems very convenient). From experience, I usually need at least two bags since the jars can be pretty heavy and I don't want to smash my fruits and vegetables in one single bag. So I might have a good excuse to get them! Though a felt-tip pen is not the most conscious purchase I've made, I'm not gonna getting rid of it because of my new lifestyle, so I'm gonna use it up and then switch to a more eco-friendly alternative. I use it to write the weight (or tare) - so it's deducted from the total weight at checkout - and reference code (or PLU) - so the cashier knows what's in my bags and containers. Some people have a whole collection of these*, and they use them for for dried goods (cereal, rice, pasta) and fruits & veggies. I, on the other hand, don't use them that much when grocery shopping. I usually simply put my fruit and veggies straight into my cart. I do need one for mushrooms, and spinach. But I always keep a bunch at the bottom of my tote, just in case (they're so lightweight!). I ordered a whole bunch of wide-mouth ones, in 16* , 32* and 64* oz. You do not have to have a whole collection of the same containers. Some people use old jam, pickle or peanut butter jars. I just happen to have started from scratch when I moved overseas. Though I do have to say that having the same containers is both pleasing to the eye and convenient (for storage, and to remember their weight when you forgot to tare them). I got a few of these at a famous Scandinavian franchise. I like swing tops and their even wider mouth which is convenient for scooping flour with a measuring cup. Similar ones can also be found online*. I regularly refill my growler* at a brewery which is within walking distance from my house. 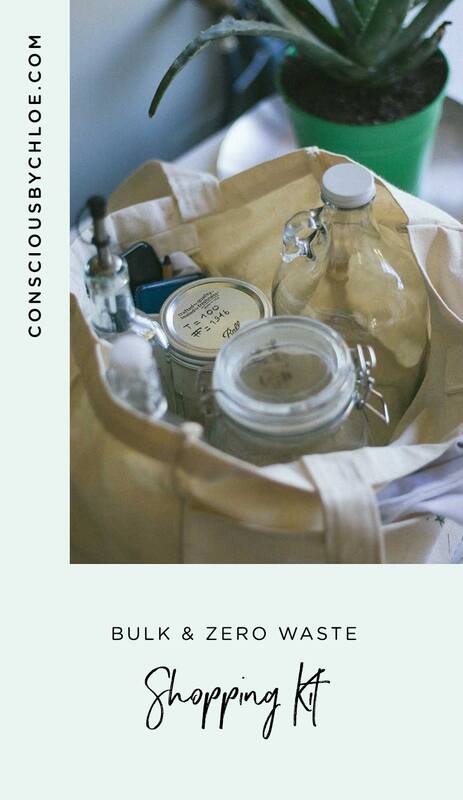 Here's a link to shop my complete Zero Waste Shopping Kit*. Finally, before leaving the house, I simply need to put any jar or container that's sitting empty in my pantry in my shopping bag. This makes shopping list writing (I label my jars) and grocery unpacking (just put the jars back on the shelves) so much easier! No need to tear up packaging and fill up your trash only minutes after having being done with the chore of grocery shopping. I've only had positive reactions from the shopping attendants. They love my way of shopping, are super helpful with the taring process, make nice comments about some of my unusual containers (I brought some super cute ones from a trip to Morocco) and are thankful to be spared from bagging my shopping (I just put everything back into my tote). In the name of full transparency, please be aware that this blog post contains affiliate links - marked with an * - and that any purchase made through them may result in a small commission for me - at no extra cost for you. Thank you so much for investing in sustainability and supporting my work! What about you, have you tried going zero waste shopping? I know it sounds scary, but I did it! I'd love to hear how it went. Feel free to share your experience with me or ask any question about zero waste shopping in the comment section below.